Thom Conboy at BYS tells me he's closed on his listing for sale, the 35.38m motor yacht Cynthia, with Wes Sanford at Northrop & Johnson representing the buyer. 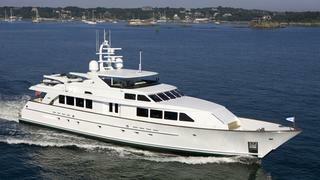 Cynthia was built by US superyacht builder Burger Boat to a design by Don O’Keefe and delivered in 2005, ABS classed. She has a Mediterranean style interior design featuring African cherry wood and Madrona burl joinery with the unmistakeable Burger Yacht beamed and coffered ceilings. Eight guests are accommodated in four staterooms. The master suite forward has a king size bed, cedar lined wardrobes, a large settee and a his and hers en suite bathroom. The three additional staterooms include a double with a queen bed and two twins. All are equipped with entertainment systems and are linked to a central server for on demand films and music. All staterooms come with en suite bathrooms. Aft of the helm area on the large flybridge is a full service bar, fridge, ice maker, grill and comfortable seating for alfresco cocktails and dining. Twin 1,650hp Caterpillar engines give Cynthia a cruising speed of 16 knots and a range of 2,500 nautical miles. Cynthia was asking $9.6 million.